We do a lot of laminating. In fact, we have six laminators of up to 60 inch width. 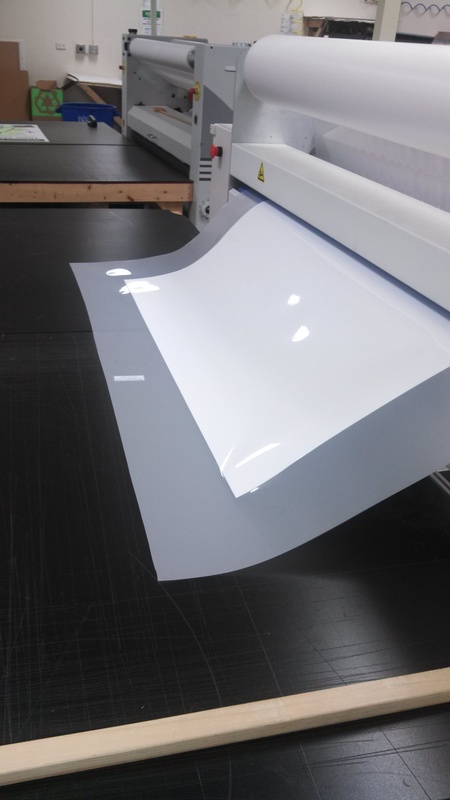 That means that we can do lamination up to 54″ width, since we need to have a little wiggle room on either side. Our choices of material are glossy, matte and crystal. Glossy gives your print the wet look of a glossy photo. Matte has a coating on it that breaks the glare, and until you get right up to it, it’s hard to tell that it’s not just paper. Crystal lamination is a textured laminate that breaks the glare completely and has an extra heavy backing. We prefer crystal laminate for trade show work. All our lamination is done by laminating both sides of the print. By leaving a sealing edge all the way around, we encapsulate the print, giving you a moisture seal. That way, if your print gets wet in shipment, moisture doesn’t get to the paper. The only time we don’t give you a sealing edge is on panels that must meet edge to edge, like pop up booth panels. There, a sealing edge would put a large seam in the graphics. This entry was posted in Trade Show Graphics and tagged crystal lamination, laminating large format, matte lamination, print lamination. Bookmark the permalink.